We endeavour to deliver your luxury boxed Daou jewellery by secure delivery as quickly as possible and within 3 days from receiving your order. Jewellery that takes longer to make to order will be specified on the product description. On the occasion that the jewellery you have ordered is out of stock, we will notify you by e-mail within 24 hours to confirm the jewellery may require time to be hand made to order and to let you know the later delivery date. The delivery charges are included for Royal Mail Special Delivery in the UK and International secure delivery. However for international orders any customs charges are the recipients responsibility. Daou cannot be held responsible for any unforeseen issues or delays caused by any delivery partner or third party. If you have any queries about the delivery of your products or if it has not arrived, please contact us at contact@daoujewellery.com. You may cancel an order within 7 working days of receipt of the product and return it in its original and unaltered condition for a full refund. However we cannot give or accept returns for bespoke, custom personalised, or specially commissioned jewellery. If you cancel a bespoke order before the item is finished, the full price will remain payable in full. Unfortunately we cannot accept refunds after the cooling off period unless pieces are faulty. If this is the case please notify us as soon as possible so that we can arrange for this to be resolved promptly. If it cannot be repaired or replaced, we will issue a refund. Please note the fine jewellery is hand made and there may be slight differences and imperfections as evidence of the nature of jewellery creation. Similarly the natural gemstones used may show slight variations in colour to those pictured, which may also be attributed to different screen settings. By placing an order through our website you agree to be bound by these terms and conditions. 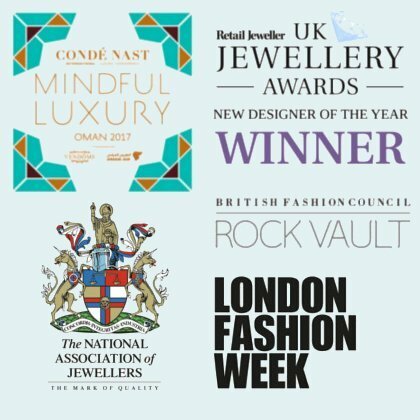 If you have any other questions or requests for information please email to contact@daoujewellery.com.